Catalog Home > Aluminum Framed Dry-Erase Board, 36" x 48"
Aluminum Framed Dry-Erase Board, 36" x 48"
This aluminum framed dry erase board features a bright white dry erase surface. Dry erase markers will write easily, dry quickly, and wipe off clean with a soft cloth or eraser. 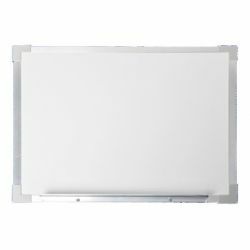 Sleek aluminum frame will match any home, school, or office decor! Measures 36" x 48".